Tiger cubs play with chicks at a zoo in Wenling, Zhejian province, May 29, 2007. 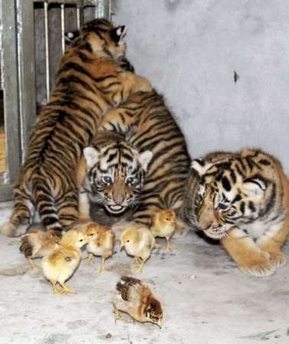 The chicks, who were not harmed by the cubs, were feeding at a nearby river before entering the tigers' cage. It is the first time zoo staff have witnessed such an occurrence, China Daily reported. Ew, what a horrible caption! Give us a better one, please. Entries will remain open until 11:59 PM, Central Standard Time, Tuesday, June 5. Submit your captions in the comments section, or email at mccracken.ken@gmail.com. Yes, they are mine - all natural. And my dentist can prove it! A post-operative Geddy Lee answers questions at a press conference promoting the 'Rush: 2007 Summer Tour'. "No, I don't wear a cup. I wear two." Ours is not to reason why, ours is but to CAPTION OR DIE. Enter today! Alright!!!! Mom got us PEEPS! The Associated Press and the New Times uncovered definitive prrof that there was a petting zoo at the Abu Ghraib prison. PETA is calling for an investigation while Rush Limbaugh is asking for 'original recipe'. Wife: "...and dear try one, they taste like chicken"
Husband: "That's because they are chickens"
Once it worked on the test tigers,Hillarys' campaign moved fast to "enhance" all U.S. water supplies with the new N.O.N.A.D. serum. Her: Yeah, try to catch one. Seeking to increase revenues, zookeepers conducted a trial run of "Survival of the Fittest: Animal Gladiators!" While hanging out with his brothers, Tweety Bird suddenly realizes that he tees a putty tat. "We might as well have had Chinese food. I've already had four and I'm still hungry."